For several months, Amirali Ghasemi made video recordings of over 500 neon signs from shopping centers, restaurants etc. in Tehran, mainly words. These recordings were then used as the backdrop for a new series of video portraits. 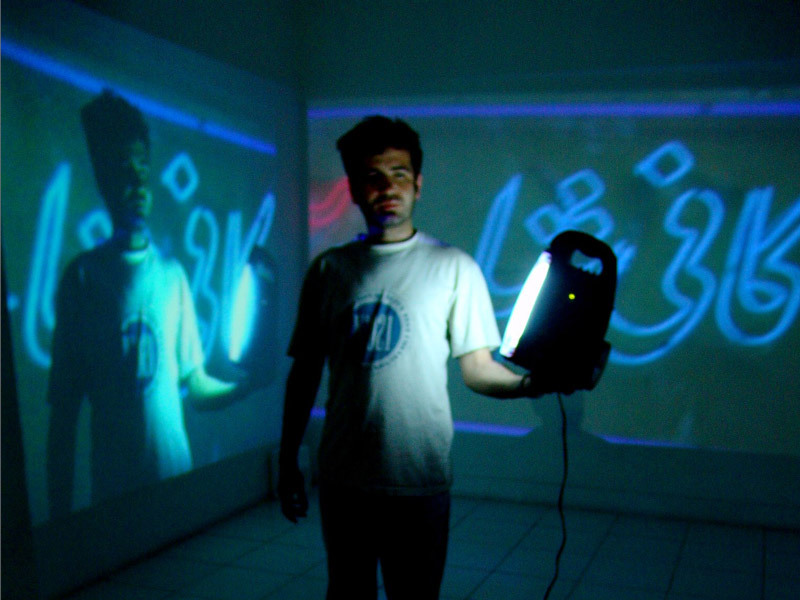 Every visitor who wanted to participate in the installation was given a torch and asked to stand in front of the camera while a video collection of random short clips from the recordings of Tehran’s flickering neon lights was played in the background. The result was recorded and screened live on another screen. The combination of random people who frequently participated and agreed to stand on the spot and the way in which each person used the light of the torch created and introduced an enormous range of new expressions & meanings. Amirali will be continuing this portrait series for the “Lion under the Rainbow” exhibition. Working in the same way with Athenian visitors, he will add a further projection: as visitors from Athens stand in front of the recording of neon signs from Tehran, they will also see a selection of the video portraits of the people in Tehran. Something of the two cities will coexist at the moment of performance.